Over the weekend I had the opportunity to go to an edcamp! It was an awful wet and rainy day, but there were over 100 teachers at #EdcampNoVA. It was great to reconnect with professional friends and colleagues. I saw Karen Richardson, Heather Hurley, and Charles Randolph among others who I only see at conferences. Met some new folks that I plan to keep my eyes on like Rachel Burkett. We spent the first little bit getting the schedule together and then got right to our sessions. I went to Flipped/Personalized PD, BreakoutEDU and Issues in PD. As always I was very interested in seeing what other teachers want to discuss. Pedagogy was top of the list with topics like Blended Learning, Student centered learning, and PBL which continue to be items that folks want t0 know more about. Feedback and assessment also seem to be recurring themes as evidenced by the topics student portfolios, homework, and video for instruction and feedback. There were a number of other topics that I was interested in like Makerspaces, Sketchnotes and virtual field trips. It’s just to bad I couldn’t clone myself. I’ll be looking at the notes that folks left for those sessions. I saw so many folks tweeting, so I went to Storify and saved what I could. I definitely want to go through those and see if there is anything else I can glean. I think the Flipped/Personalized PD session was the best out of the three sessions that I attended. There was a lot of discussion about models for PD which is something that I am very interested in. One of the conversation threads was about the definition of “professional development” at schools. Schools want to make sure you learn how to use equipment or what the new initiative is, but that is really training – not developing you as a professional. Giving PD at different readiness levels was discussed as was allowing teachers to choose what they wanted to learn about. There was also some discussion of different ways to acknowledge what teachers have learned via badges and the need to understand more of what that is and how to make it happen. I am a firm believer in the shift from seat time to competencies. There was mention of using a tech tool called flippity that I definitely need to check out. The BreakoutEDU session was interesting. I have been “looking into breakout” for about a year now. Just dabbling – not really focused yet, but I think this might be the year. Molly Patrician gave a presentation on how she used breakoutedu in her music class. I think the understanding of BreakoutEDU digital is the game changer for me. I guess in my application, I can’t see asking a teacher to invest in the actual box, locks, etc. until I can show the utility of the concept. The digital version will allow me to share that experience with my virtual learners. Also, without a cost investment, I can see more teachers willing to try and/or adopt the strategy. I’ve acquired a fundamental understanding of the need for “free” when working with teachers. I used to think that cost was a just good thing to keep in mind, but given my work now I realize what a huge deterrent it is. The issues in PD session was a bit different that I had anticipated. Of course getting there late didn’t help. I got caught up in a great conversation about ed tech coaching with Natalie Davis and didn’t even realize that the next session had started! There were only 6 of us in the “issues” session – half worked out of the same county. That made for limited exchange and we kept chasing down rabbit holes. We did identify a few issues – the major one being teacher time – and exchanged some strategies that worked. I have a lot of followup work to do, but I think the day was definitely worth it. The one thing that I keep bumping into is that many ed tech coaches need a place to gather and talk with other ed tech coaches. Especially those in small systems or coaches who trying to lead the changeover from “fixit” to “instructional resource”. It was evident here today in so many ways. Overall, I find the whole edcamp experience a bit energizing. I get up early and go to Starbucks – no one want to see me early and uncaffeinated – and then brace myself for early morning excited teachers. I’m usually in sync by the time the board is made…the whole up and at ’em before 10AM just throws this nite owl for a bit of a loop. 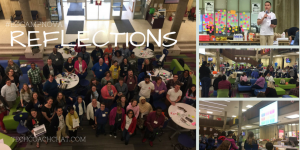 If you’ve never been to and edcamp, trust me you should go to the next one you find out about. Here is a link to the published schedule. If there isn’t one scheduled near you, there are a few online ones and of course you could follow them via twitter. There are people who travel a number of hours to get to edcamps – I met someone at edcampNoVA who was from 3 hours away – so don’t feel as though you aren’t going to be welcome if it isn’t in your neck of the woods. 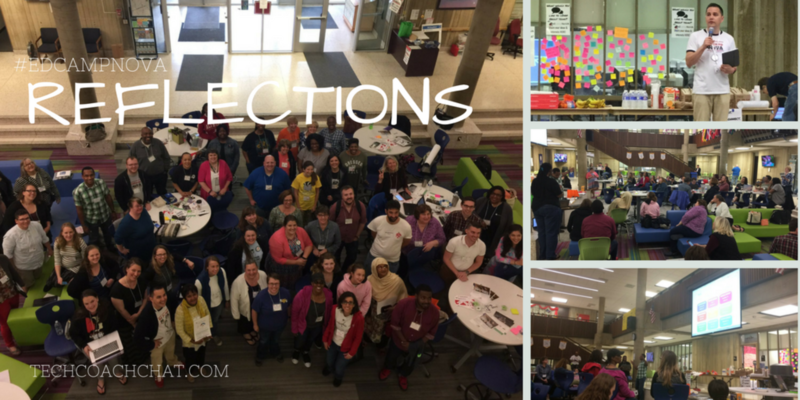 What’s your favorite part of the edcamp experience?